- Full (Turn-key) service: from scratch to completion. We start with designing your unit and finish when the entire project is completed, leaving your heater or oven ready for use. - Core only. Sometimes our customers want to face the heaters or ovens themselves or with help of a local mason. 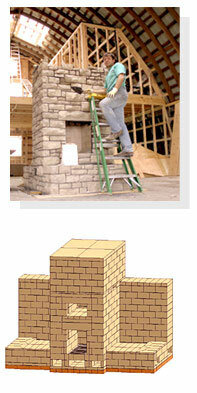 In this case, we would only design and build the firebrick core and install the chimney. With commercial brick ovens, we do core construction, insulation and chimney as the minimal scope of work since this guarantees proper performance of the oven. The rest can be done by the ownerâ€™s representatives if they wish so. - Design only. We receive many requests for designing masonry heaters for people who want to build themselves or want to hire a local general mason. We do custom design, producing a comprehensive easy-to-follow drawings package. If you are considering building the stove yourself, please note that at least minimal experience with general masonry and understanding of principals of work with refractory materials are necessary for the successful completion of the project. For detailed information and term of such service, visit "Drawings for Self-Builders" page. Consultations for self-builders and troubleshooting.